Texas A&M enters a new era in the SEC against a tough Florida team. Florida struggled at times against a weak Bowling Green squad but both Jeff Driskel and Jacoby Brissett should feel more comfortable in their second games. A&M also unveils a new quarterback is Johnny Manziel who will have the whole crowd behind him as the game is being played in Kyle Field. He'll have his work cut out for him as the Gators have a speedy and dangerous defense. Mike Gillislee had a great first game carrying for two touchdowns. The Aggies have a good but young defense so expect Florida to run constantly. Both these teams seem evenly matched. It will end up being the better quarterback gets the win. LSU still believes they are elite even without Tyrann Mathieu and is the first game they can prove it. Washington is headed by Keith Price and tight end Austin Seferian-Jenkins but Price will have to deal with the Tigers' pass rush that includes Sam Montgomery, Bennie Logan and Barkevious Mingo. LSU could shut down Washington's offense even without Mathieu, but they won't win without scoring some also. They will run a lot with the talented backfield but one of the biggest questions is quarterback. Zach Mettenberger played decent against North Texas but must prove he can hang with more elite defenses. Even if Mettenberger struggles to get comfortable with this defense, LSU should roll to 2-0. Another new SEC begins conference play against a fantastic Georgia team. The Bulldogs are headed by Heisman candidate Aaron Murray who threw for 258 yards against Buffalo. Of course, the Tigers should provide more of a challenge to Murray but maybe not by much. The player Mizzou should be most worried about is freshman Todd Gurley who dominated against the Bulls. He had 100 yards on just 8 carries for two touchdowns. Missouri has had their fair share of injuries but it looks like quarterback James Franklin and Kendai Lawrence will play against Georgia. 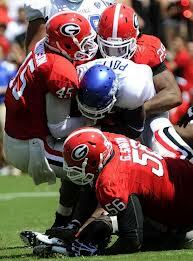 They will look to attack this Bulldogs defense as Mark Richt will probably be without Bacarri Rambo and Alec Ogletree. Even without those two the Bulldogs defense is solid enough to take home their first SEC victory of the season. After the 84-0 beatdown they put on Savannah State, Oklahoma State gets their first "challenge" against Arizona. After surviving Toledo, the Wildcats are trying to pull off a big upset headed by Matt Scott, who had 387 yards in Week One. Scott can run and of course pass, but he must adjust to the dangerous defense of the Cowboys. Meanwhile, the 'Boys are headed by back Joseph Randle who could do dangerous things aginst this weak Wildcats rush defense. Arizona will try to counter Oklahoma State's two headed quarterback offense with Wes Lunt and J.W. Walsh. The game could be decided by how Brodrick Brown and the rest of the Cowboys secondary handle Scott. And, they likely will.